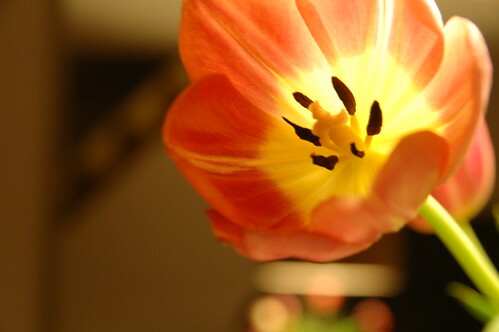 I really love tulips. I especially like it when they start to droop over. This fall I am definitely going to plant some bulbs for next year. Please hold me to it. oh boy! you’d love my kitchen/sewing area right now. 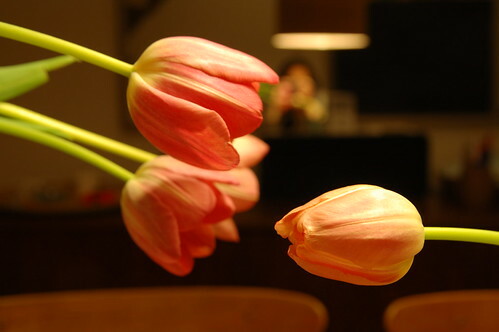 Eric bought me 3 dozen tulips this week from the farmers market and they are in pom glasses drooping over, lol. I should really get ready to part with them but I just can’t! ooh! I want to do that too this fall! Tulips and daffodils! I will remind you this year! I am sooooo jealous !!!! Daffodils and tulips are my favourites !!! No flower of that kind around here…. I’ve said I’d plant tulips for 2 years in a row now. I kick myself each spring when I see them pop up in other people’s gardens. You missed the Tulips here in Ottawa… There were so many different kids with weird names, I will post them when I get back to Toronto!